ISTANBUL — Suicide attackers killed more than 30 (updated to 41 dead, 239 injured) people and wounded dozens more at Istanbul’s main airport on Tuesday night, in the latest in a string of terrorist attacks in Turkey, a NATO ally once seen as a bastion of stability but now increasingly consumed by the chaos of the Middle East. Shortly before 10 p.m., officials said, two gunmen opened fire with automatic weapons at a security checkpoint outside Istanbul’s Ataturk airport, one of Europe’s busiest, and then detonated their explosives, setting off two fireballs. 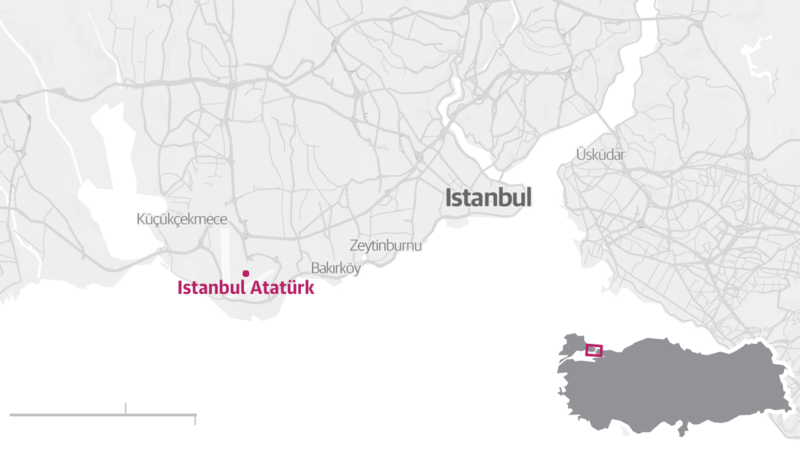 A third attacker detonated explosives in the parking lot, a Turkish official said. The attack killed at least 36 people and wounded more than 140 (updated to 41 dead, 239 injured), officials said. Hours after the assault, Prime Minister Binali Yildirim said that the early indications suggested that the Islamic State was responsible. But as of early Wednesday, the group had not claimed responsibility for the attack. The vast majority of the dead were Turks, although some were foreigners, according to a Turkish official. All three of the attackers were killed, officials said. Outside the terminal on Tuesday night, as calls went out on local news channels for blood donors and the Turkish authorities imposed a ban on publishing images of the scene of the attack, ambulances streamed in, while hundreds of dazed and scared travelers sat on the sidewalk waiting for information. And more travelers, many in tears, were streaming out of the airport. As Turkey has faced several deadly terrorist attacks over the past year, Ms. Kaya said she never thought she would find herself in the middle of one. “We’ve watched these attacks on TV for months, but I never imagined it would happen with so much security in an airport,” she said. President Recep Tayyip Erdogan, in a statement, noted that the bombing came during the Muslim holy month of Ramadan, and called for global unity in the fight against terrorism. A car bomb destroyed a police vehicle near a central tourist district in Istanbul on Tuesday morning, instantly killing 11 people and wounding dozens more, Turkish officials said, the latest in a series of deadly attacks in the country. A suicide bomber struck a main avenue in Istanbul, killing at least four, including two Americans. Turkey said the Islamic State had carried out the attack. The attack was a bloody reminder that Turkey, once seen as a jewel of a tourist destination and an oasis of stability in a chaotic region, has increasingly become caught up in the turmoil of the Middle East. It has faced a string of terrorist attacks over the past year, including several in Istanbul, as it faces threats from both the Islamic State and Kurdish militants fighting a war with the Turkish state in the southeast. Turkey once held itself up as an exemplar of a stable, Muslim democracy and sought to influence the region by reaching out to its Muslim neighbors. Early on, when Syria slipped into civil war in 2011, Turkey pushed for the ouster of President Bashar al-Assad and began helping Syrian rebel groups, allowing the transit of fighters and weapons across its territory. Turkey’s Western allies, including the United States, blamed the country’s open-border policy for allowing the extremist groups like the Islamic State to become powerful inside Syria, and the chaos has increasingly spilled over into Turkey, with terrorist attacks and waves of refugees. Turkey, a NATO member, has often been at odds with its Western allies over its approach to the region. The United States and others believe that Turkey’s early policy on Syria enabled the growth of the Islamic State, and have long felt that Turkey was a reluctant partner in fighting the terrorist group. Turkey, in turn, has grown angry over American support for Syrian Kurdish rebels that it sees as terrorists because of links to Kurdish militants inside Turkey. More than 30 people were killed in the attack at Turkey’s largest airport. Some of the recent terrorist attacks in Turkey — including a car bombing in Ankara, the capital, in February — have been attributed to Kurdish militants, which have heightened tensions between Ankara and Washington over the support the United States has given to Syrian Kurdish militants fighting the Islamic State. The attack on Tuesday evoked the bombing of the Brussels airport several months ago, and highlighted the conundrum security officials face in minimizing casualties from terrorist attacks. 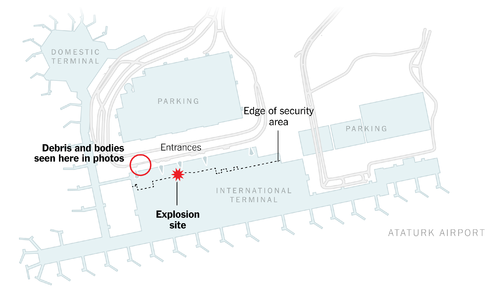 In Brussels, the attackers managed to get inside the terminal and detonate their explosives. But at the Istanbul airport, the first security check is in a vestibule at the entrance to the terminal, which theoretically adds a layer of security. But even so, people have to line up there and, as the attack demonstrated, it is an easy target for terrorists. Judith Favish, a South African who was heading home, said she was at the counter checking in for her flight when she heard gunfire and then an explosion. She paused, and then said that she had seen blood everywhere near the entranceway. Flights out of Istanbul were immediately canceled Tuesday night, and ones on their way were diverted. The airport, the third busiest in Europe and the 11th busiest in the world, was closed after the attack, but Mr. Yildirim, the prime minister, said early Wednesday that it had reopened. Although no group claimed responsibility for the attack, initial speculation centered on Turkey’s two main enemies: the Islamic State, also known as ISIS or ISIL, and Kurdish militants linked to the Kurdistan Workers’ Party, or P.K.K., which has waged war with Turkey for more than three decades. Last year, peace talks with the P.K.K. broke down, and the two sides have been at war since. But as hours passed after the attack, Turkish officials turned their attention toward the Islamic State. Turkey has been rocked by a series of bombings since 2014, and the attacks have been increasing in frequency. In some cases, Kurdish militants have claimed responsibility, but in others, including ones this year in Istanbul’s old city and on its main pedestrian boulevard, Turkish officials have blamed the Islamic State. Almost immediately, there was speculation that the attack might have been a response by the Islamic State to the recent reconciliation between Turkey and Israel, which announced a wide-ranging deal this week to restore diplomatic relations. The two countries had been estranged for six years, after an episode in 2010 in which Israeli commandos stormed a flotilla carrying humanitarian aid for the Gaza Strip in defiance of an Israeli blockade; several Turkish activists were killed.